Adapted by Selick from Neil Gaiman’s bestselling novel of the same name, Coraline tells the fantastic tale of Coraline Jones (voiced by Dakota Fanning), an 11-year-old girl who discovers an other world when she ventures through a secret doorway in the house she has recently moved into with her parents. There, her world is literally turned inside out when she is met by her Other Mother (voiced by Teri Hatcher), an overly attentive parent with buttons for eyes who gives Coraline everything she wants, until she demands the impossible in return. Henry Selick, who’d amazed audiences with his 1993 scary fun feature, The Nightmare Before Chrstmas, first saw the potential in animating Neil Gaiman’s novel. And LAIKA agreed, putting all their resources behind putting Selick’s vision on the screen. “I thought we had all the vital ingredients for a truly exceptional film: a beautiful, best-selling novel written by a master; a brilliant, visionary director at the helm; an army of passionate, world-class artists; and a groundbreaking production process that honored tradition while looking toward the future,” recalls LAIKA's President and CEO Travis Knight to Wired. The only problem is that no Hollywood studio was interested in making the movie. That is until Focus Features stepped up to partner with LAIKA. While many animation companies were going fully digital, investing all their capital into the immense computing power necessary for CGI, LAIKA wanted to return to making things by hand. Working out of a 140,000 square-foot lot in Hillboro, OR, just 20 miles outside of Portland, LAIKA brought together craftspeople from around the world to conjure up Coraline’s world from sewn-together costumes, hand-painted sets, and carefully constructed trees and bushes. Not that they were completely low tech. They used unprecedented 3D printing technology to bring emotions to their puppets. Churning out over 600 mouths and 300 brows, the animators could mix these facials features to give Coraline 200,000 facial expressions. The production was meticulous and slow. To create Coraline’s world, they divided the LAIKA lot into 150 mini-sets, each able to tell a part of the story, one frame at a time. In addition, they shot the film to be projected in real 3D, a procedure that meant that every set up had to be captured at least twice. Working with 29 animators toiling full-time, they could only produce 90-100 seconds of film a week. "Sometimes it's maddening to work in this medium, because of the imperfections. But that's one of the things that makes it inherently beautiful." When Coraline was finally released, the filmmakers' unwavering belief in their story and mode of storytelling was fully realized. “With stop-motion animation in danger of becoming a lost art in the age of digital animation, Coraline is a reminder of the medium's potential in the hands of imaginative creators and talented animators,” exclaimed the Seattle Post-Intelligencer’s Sean Axmaker. The film was nominated for an Academy Award for Best Animated Feature, as well as a long list of other awards. 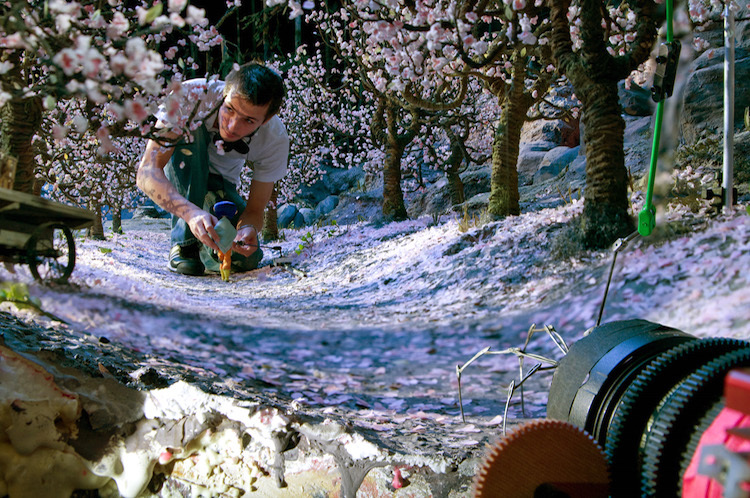 With each film, LAIKA advances the technology and aesthetics of stop-motion animation. But the joy of creating unimaginable worlds with one’s hands, a passion that fueled the making of Coraline, remains the same. "Sometimes it's maddening to work in this medium, because of the imperfections,” explains Knight to the Verge. “But that's one of the things that makes it inherently beautiful. We really embrace that side of it, because it makes these films human."